This report provides a bit of a feel for the accuracy of using Loki in an actual data collection scenario. In mid-November of 2017 we flew a limestone mine site with the goal of generating 1 foot topographic contours (“topo”) to be used for planning operations. For comparison, we have the good fortune of having 1 foot contours available that were produced in January of 2017 from high accuracy airborne topographic LIDAR. These data give us the opportunity to explore the vertical conformance of the drone derived point cloud in areas of undisturbed ground throughout the project. The information in this section is meant to be a thought exercise, not a mathematically precise discussion of the elements that affect photogrammetric accuracy. I find it quite useful for making “rule of thumb” decisions regarding accuracy planning. 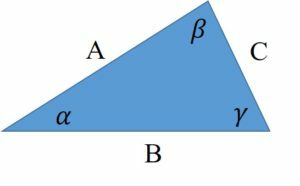 If we consider the triangle of Figure 1, we recall that given any two sides, we can solve for the third. Similarly, given any two angles, the third is defined. This report is using primarily United States Customary System (USCS) units as these are used in the US mining industry. All units of feet are US Survey Feet. This entry was posted in AirGon Case Studies and tagged accuracy, direct geopositioning, gnss, Loki, photogrammetry, post processed kinematic, ppk, structure from motion.